Since December last year I’ve been living in my new apartment. And I have not covered a room-to-room home tour so far. Blame it to many facts like missing pieces of furniture or last decoration projects. However, today I am inviting you to tour the coziest room of my new apartment: the bedroom. Even though I shared pics of my bedroom on Instagram and a few times here on the blog too, today I want to give you a full tour of the bedroom and its decoration. Let’s roll! Before I move to the details: I am not a professional interior designer, stylist or decorator. Whatever I do, I do intrinsically. Creating a room is more of a intuitional project than anything planned or scheduled. Yes, I do spend a few thoughts on bigger furniture pieces (like which wardrobe to choose for the bedroom), but most of the time things happen ‘coincidentially’. I am a firm believer that the best decorator for your home is your gut feeling. At least for me it works best. But let me talk about the details of my bedroom styling now. The heart of my bedroom is the bed. Of course, this should be the heart of every bedroom, right? For a long time I have dreamed of a box-spring bed but in my old apartment there was simply no space for such a comfy solution. But my new apartment was the perfect frame for such a comfortable bed (in fact, the bedroom is the biggest room in my apartment). When Treca Interiors Paris knocked on my ‘virtual door’ and asked for a collaboration, it felt like destiny worked its magic. Before I even moved into the apartment, I had a brand new box-spring bed in my apartment: the 24Seven bed with Cloud headboard – made in France! The bed is truly a dream come true. I also added a high-quality topper and sleeping in my bed feels like sleeping on a cloud. My lifestyle is rather busy and honestly, I don’t get a lot of sleep during the week. So when I sleep I really want to enjoy it to the max. And with this bed I do enjoy every single minute in bed (no pun intended LOL). As you can see, I chose a grey upholstery fabric because I already had one other thing in mind: A dark-blue feature wall behind the bed. If you are a serious decorator, you can probably spend days if not weeks choosing the right hue for a wall. But if you are Igor, it takes probably half an hour tops. Luckily I met Monja, the girl behind the young German paint label Kolorat, a few months before moving. We chatted about wall paints and interior design, and when I came to the point to choose paints I glanced the portfolio of Kolorat and quickly came up with an idea. For the bedroom I wanted a deep, velvety blue that has a soothing and calming effect. I love blue in all its shades, so for the bedroom I picked THIS hue. And as mentioned before, one thing leads to the next. I remembered seeing some dark blue velvet curtains (at IKEA. So these were the perfect addition for the bedroom along with natural semi-transparent linen curtains (model Lejongap), also from IKEA. Next challenge: Bedside tables. Since box-spring beds tend to be higher than regular beds, I needed an adequate solution. In my old apartment I already had a wonderful Tray Table designed by Hans Bolling as a sidetable, so I tried this and hey it was just perfect! The perfect hight and the perfect look against the dark blue wall. So I went for a second Tray Table via Danish manufacturer Brdr. Krüger and voilà that challenge was quickly solved (featuring the Cestita table lamp from Santa & Cole and the Milk lamp from &Tradition). Next task: cosy and nice bedside rugs. 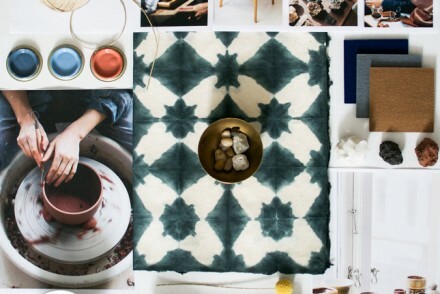 For this I turned to a young design label from Serbia named NITI kilims & blankets. They manufacture kilim rugs in the mountains of Serbia from local wool. They weave the kilims on traditional looms and their designs are contemporary interpretations of traditional motives. Perfect I thought so I ordered two kilim rugs named ‘Merak’. Now I needed storage solutions – for my clothes and for my bedding, blankets, towels etc. Right from the beginning I wanted an open shelving system. I don’t like huge, compact wardrobes as they are so dominant when you enter a room. I wanted something more airy. My choice was IKEA’s ELVARLI system. You can configure the system to your needs and create your own wardrobe solution. I am pretty happy with it! For my bedlinen and towels I wanted a separate solution so I went for the beautiful Stockholm rattan cabinet, also by IKEA. I also added a rattan bench from IKEA in front of the bed – as extra sitting solution and storage solution for blankets and cushions. Ideal partner in this setting: the SINNERLIG bamboo pendant. Another addition is the ‘Tropical Green’ rug from Spanish design label Lorena Canals Rugs. I like the vibrancy created by the foliage design together with the dark blue feature wall and the natural materials in the bedroom. Last but not least I added my vintage teak secretary to the bedroom for extra storage and as a sort of ‘home office’ even though I hardly work there. In general, what I wanted for my bedroom was a calm, natural vibe with lots of texture to please the senses. I want to feel and touch everything. Walking barefoot is perfect – from the wooden parquet to the fluffy rug to the woolen flatweave of the kilims. Also feeling the materials and textiles is essential to me. I hope you enjoyed this little tour of my bedroom. I tried to give you all product names and brands here. In case you want to know more or there is something missing, feel free to ask me in the comments section. And I promise to continue soon with the room-to-room home tour of my new apartment. This blog post has been brought to you in collaboration with Treca Interiors Paris, Kolorat, Brdr. Krüger and Lorena Canals Rugs. As always all opinions and photos are my own. Thank you for supporting the brands who support this blog! Love this room. Simple yet so warm and inviting! That blue wall and that print are gorgeous and grab your attention immediately. And the wardrobe is just exactly what it should be. Loved this tour! Thank you a lot Jasleen! Beautiful. I, too have been looking for the perfect blue for my headboard wall in my bedroom. Since we do not have Kolorat in the states, I guess I will have to keep on looking! Thank you Mark! I am pretty sure you will find the perfect shade of blue for your bedroom too! I love it so many personal details it could never be accused of being yet another Pinterest copy. Professional or not the design and styling is impeccible as always. Great source list I now have 2 new rug sources. Thank you so much Nicolette! I am really happy with the bedroom even though it is always in flux. I like to keep changing bits and pieces, just to keep it fun and evolving:-) I guess that’s our mutual weakness, right?! A beautiful, relaxing room. Thank you for sharing! Are you able to tell me the name of the artist who has done the picture of the woman and cat in the conservatory? Hi Jade!! Sure, it is the artwork of Dutch artist Like van der Vorst. Lovely to have a sneak peek of your new home! I looooove the Monstera rug and I looooove even more your quote ” the best decorator for your home is your gut feeling “!! Thanks a lot Nannette!!! That is my natural approach to interior styling (which is why I am good at it for my home but I could not do it for other people’s homes LOL). Oduševljena sam sa tvojom stranicom. Upravo se vraćam iz Bg-a i nisam mogla da pronadjem radnju da kupim nešto od njih. Da li mozda znas gde se mogu kupiti njihova dela, pošto uskoro ponovo putujem u Begeš. Hvala ti najlepše unapred za odgovor i obavezno nastavi svoj ambicijosni blog. your blog is truly inspirational and authentical. I really admire everything that is displayed on your blog, but fell deeply in love with Niti and folkk. (Maybe it is due to my inner love to Serbia and it‘s great generosity and southern soul.) Still, I couldn’t find any shops in Belgrade selling the ethno items of these brands on my last trip. I must admit that I haven‘t looked in Savamala (was there only at night ;-). Could you be so kind and help me with some addresses where to look after during my next trip to Bgd? Thank you so much in advance and please continue with your passionate blog. Cao Jelena! Hvala ti puno na divnom komentaru! Ja sam isto veliki fan NITI proizvoda a i Folkk-a! U Beogradu mozes naci Folkk i jos vise brendova iz Srbije a i vintage proizvode u Makadamu, pogledaj na mom blogu, pisao sam o njima, tamo je i link i adresa. A NITI je najlakse naruciti preko Instagrama, tamo im je email adresa i Ljubica (devojka koja vodi NITI) se uvek brzo javlja i pomaze. Ja imam i divno cebe i ova dva cilima od NITI. I jako sam zadovoljan!! Nadam se da ti je to od pomoci za sledeci boravak u Beogradu. Pozdrav!! Die Decke hat eine so tolle Farbe:-). Gefällt mir sehr!